My quest for servant leadership began when I realized my own corporate leaders lacked the ability to embrace their work as their worship. I heard these leaders speak of their faith, but I often witnessed my coworkers get hurt as a result of their actions. Oftentimes, they seemed ignorant about the business application of their faith. There just seemed to be a disconnect with exemplifying their faith within the constraints of their leadership role. I found myself trying to encourage my peers after leaders did little to support their individual work efforts, regardless of the outcome. I felt it more important to come alongside my peers and help them accomplish their goals, while I was being taunted by the same leader. This situation made me ponder the question many may consider when they read about servant leadership principles. Can you experience servant leadership if your leader does not display compatible characteristics: trust, agape love, humility, service, altruism, vision and empowerment? I’d say yes, since it’s possible for a peer to demonstrate true servant leadership qualities that make an indelible impression upon their colleagues and even their leaders. Regardless of which direction servant leadership flows, it only matters that it flows — upward, sideways or downward. Its impact is meaningful to the culture, leaving a corporate legacy and creating better citizens of the world. The essence of servant leadership is about valuing results and relationships. Servant leaders are not limited to management titles. The heart is the true qualifier. Their impact is genuinely changing the world, one organization at a time. Those they touch become better citizens in their homes and communities alike. It starts with one person showing another what they do and say matters. This increase in self-esteem does more good as it flows to another and then to another, all because someone cared to make a difference. I enjoyed seeing my peers feel empowered, not only in the office but in their personal lives as well. Serving them as a peer was powerful enough, but it would have been even more powerful to receive recognition from the leader — but that person missed the opportunity to make a difference. Ultimately, the impact on the team was the same regardless of who started the act of serving — the peer or the leader. Be encouraged to make a difference today with servant leadership behaviors regardless of your role on the team. It’s the posture of the heart that matters most. 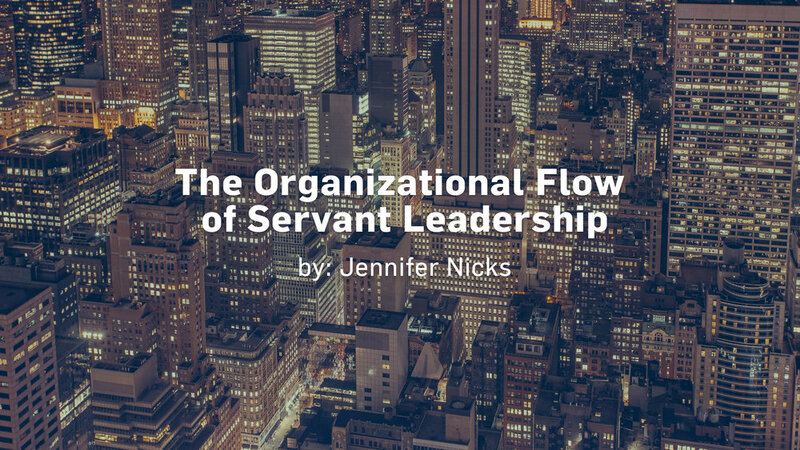 Jennifer Nicks lives in suburban metro Atlanta and is pursuing Servant Leadership studies to come alongside organizations who wish to consistently embrace acts of service throughout their organization. Her faith is her driving force and she is actively engaged in a local ministry that impacts nations. It is her vision to be a change agent for nations and the world, one organization at a time.